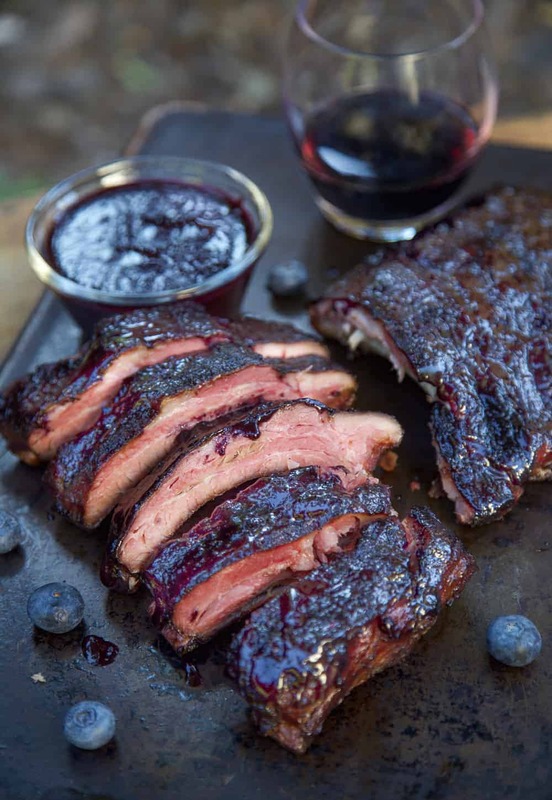 Blueberry Bourbon Smoked Ribs have incredible rich and savory flavors that will wow your guests next time you smoke ribs. This is a fun smoked rib recipe to try if you want to change up from traditional BBQ flavors. Blueberry season has officially arrived in the Pacific Northwest. I friggin love blueberries. To me, they’re the perfect berry – not too sweet, not too messy, they hold up well, and they freeze like a champ. 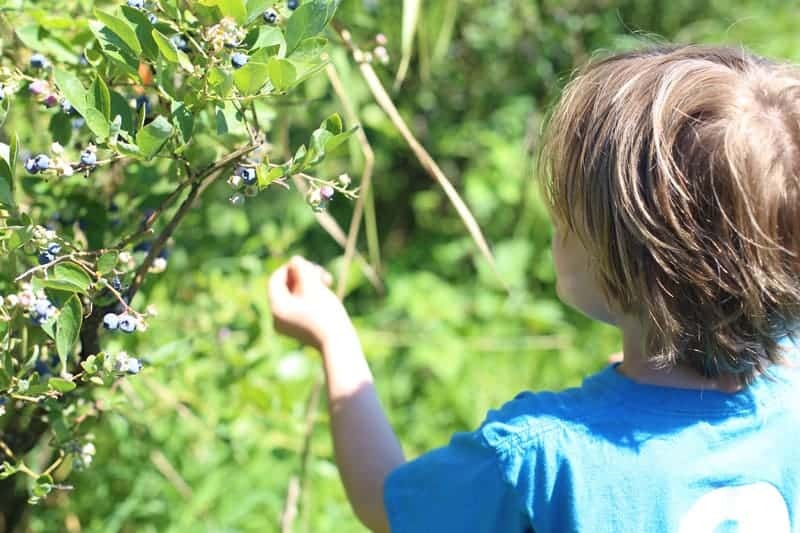 Plus my kids look forward to berry picking all year. Granted this is likely because they eat more berries off the bushes than we actually collect and take home (shhh don’t tell this to our favorite farm we go to). But berries are also something that can be added to any number of recipes. So we finally ventured out this week to collect some berries. You all probably know by now that we aren’t sugar freaks around here, meaning we prefer savory flavors to sweet, and we don’t use a lot of sugar in our recipes, nor do we focus too heavily on tomato based sweeter style sauces. 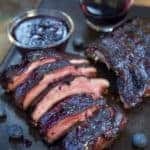 The idea for this blueberry bbq sauce was to add some rich blueberry flavors and add in some bourbon because, well, bourbon. And some rosemary for an herbal savory touch. Holy crap, it’s such a fantastic mix! I’ve gotta tell you, it’s so delicious and interesting, and good on so many things (chicken, pork, heck it’s good on chocolate!!!). This is a winner and I’m excited to share it with you. We decided to feature it on ribs, because it really adds a great dimension with pork ribs, and since we’ve got some other rib recipes in the works, we wanted to start with this style. There’s really no such thing as too many rib recipes, right? To make this sauce just heat up everything in a small to medium size pot to a simmer. 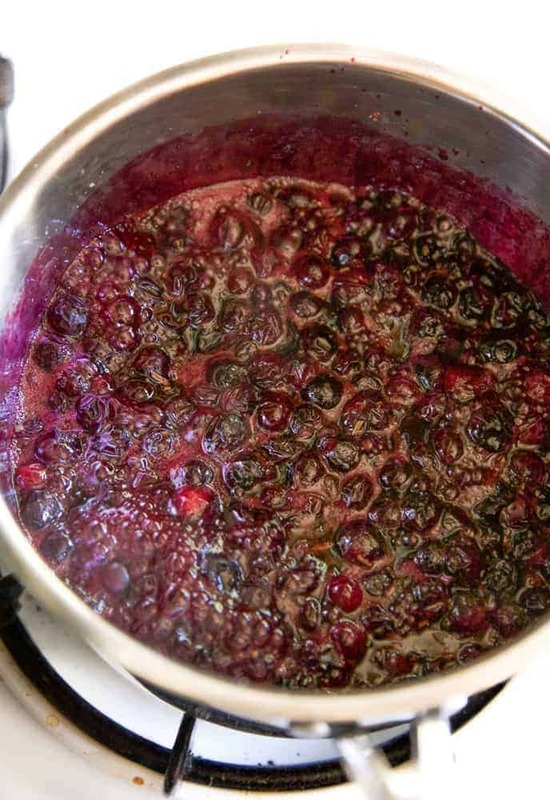 Then lower heat for about 8 minutes, and either crush the berries with a fork or blend with a food processor or blender. Adjust flavors (Berries not quite ripe? Add cane sugar. Want some citrus if too sweet? Add some lemon.). Then set aside. This is meant to be more of a finishing glaze rather than a thick BBQ sauce, so it may be thin at first, but will thicken up as it comes to room temp or in the fridge. We used baby back ribs for these. Pay attention to the amount of meat on your ribs. This will affect cooking times. These were hearty ribs, which required more cooking time than if they had been smaller and leaner. Remove any silver skin that is on the bone side of the ribs, and trim off any excess fat. Start by coating the ribs with Dijon mustard so the dry rub will stick, and then apply your dry rub. You are going to be adding that semi-sweet and savory sauce at the end of the cook, which will add additional flavor, so keep that in mind with the rub you use for this. For our rub, we went heavier on savory flavors — like onion powder, dry mustard and paprika to offset the typical mix of sugar – to compliment the savoriness in the sauce. Let the rub sit awhile before placing on the smoker. In this case just 15 minutes to let the rub set. You’ll see the sugar and salt begin to dissolve and liquefy, which is getting into that cut of meat. If you have a few hours, then put that rub on a few hours before you cook (and season it up to 6 hours prior to cook). We kept the smoker at 250 degrees Fahrenheit during the entire cook, using fruit wood (like cherry) for ribs. We live in Oregon, this is where most cherries in the US come from! We always cook with a water pan. 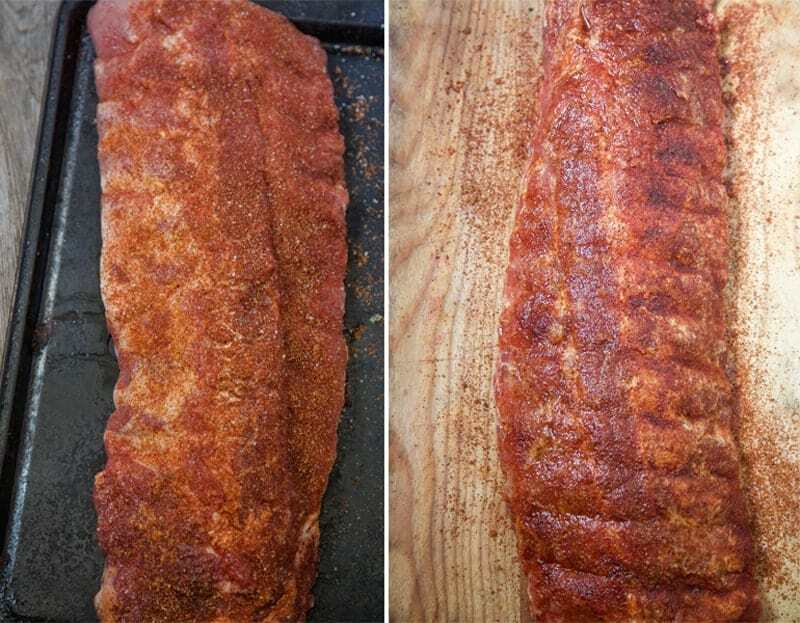 The added moisture to the cooking chamber really helps with color on the ribs in my opinion and keeping the texture moist. Now on to the cooking method. We used a variation of the 3-2-1 method. If you’re not familiar with that process see this post for competition style ribs. Simply put, you smoke for 3 hours, then wrap for 2 hours, then uncover and sauce for up to an hour letting the sauce tack up. 3 — During the first 3 hours, you’ll want to spritz your meat occasionally to keep it moist. We use a mix of apple cider vinegar and water (or apple juice). It adds a touch of sweet due to the apple, so a nice way to offset a savory rub. Spritzing after that first hour every 15 minutes helps lock in flavor. Moisture helps that smoke influence stick to the meat. And with the sugar, helps with the caramelization. 2 – Now we focus on wrapping. By now the bones from the ribs should start to show. The wrapping will allow the meat to baste with a modest liquid to create tenderness. Lay out aluminum foil and place 2 tablespoons of butter and some agave nectar (or honey). Feel free to add some of the spritz liquid too. Then enclose the ribs in a foil pouch and place meat side down your cooker. Over the two hours it will steam and baste in the liquid creating that soft texture. Remove the foil after two hours; you’ll see that the bone in the rib is showing more. This is where that butter and honey basted the ribs and added a ton of flavor. Smaller ribs? Then check at 90 minutes to see if the foil needs to come off. Tug the bones, they should wiggle but not come out of meat. 1 – The last hour is unwrapped. 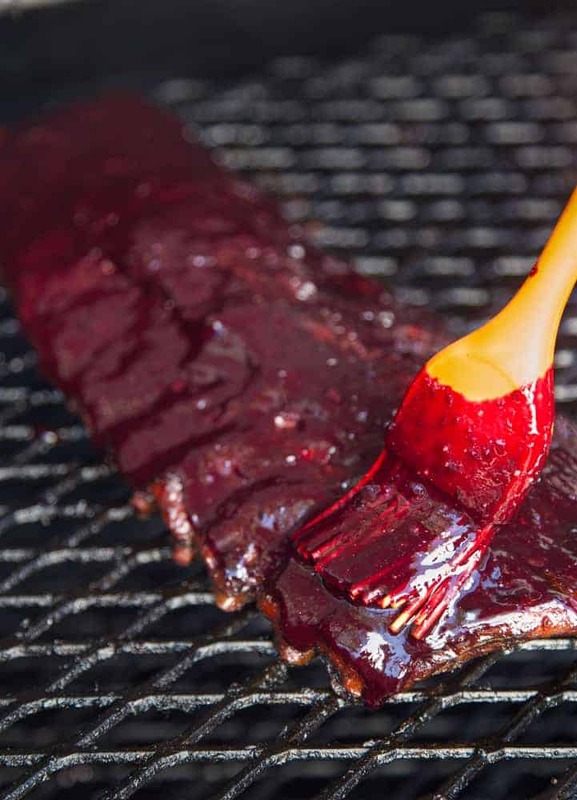 Here is where you apply that blueberry bourbon bbq sauce. Apply the sauce when you unwrap the ribs and continue cooking. You know it’s done when you can wiggle the bones and they are slightly able to come out with a tug. Voila! Look at the richness of the color! It’s dark and intense looking, but the flavor is out of this world. You have the savory pork and the flavors of the rub and then the sweet blueberries and the savory rosemary. It’s fascinating and incredibly delicious. 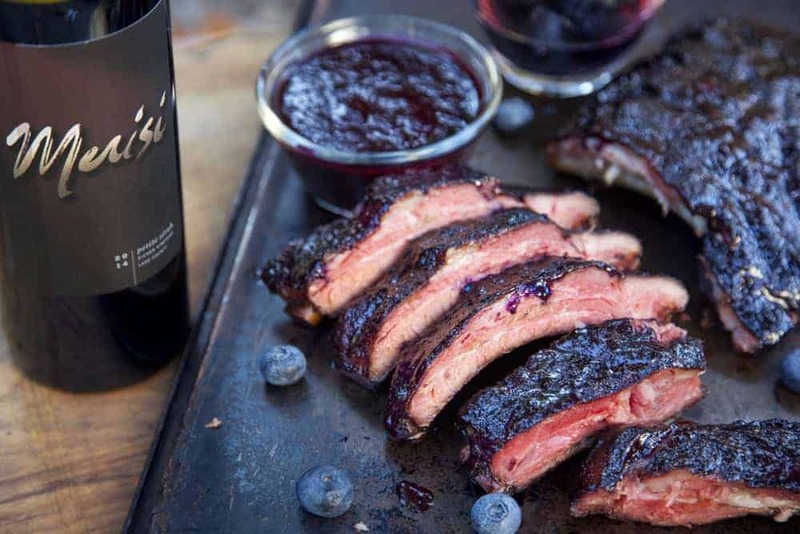 Blueberry Bourbon Smoked Ribs have incredible rich and savory flavors that will wow your guests next time you smoke ribs. 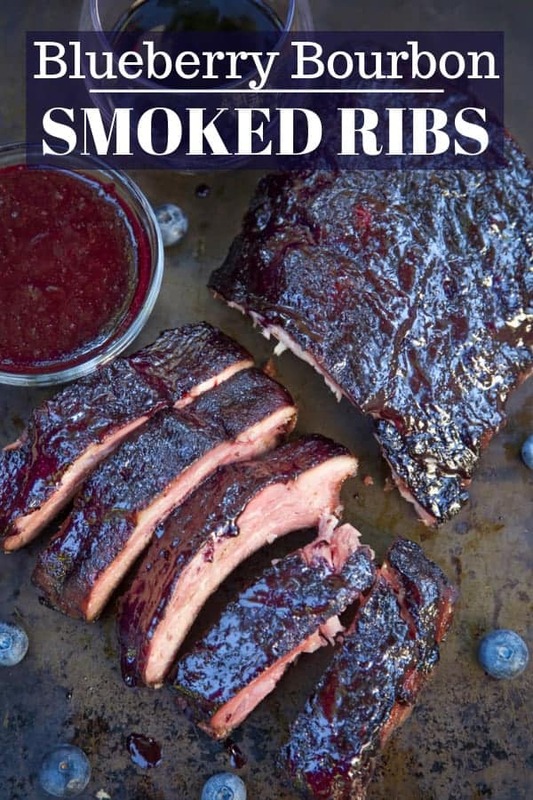 This is a fun smoked rib recipe to try if you want to change up from traditional BBQ flavors. 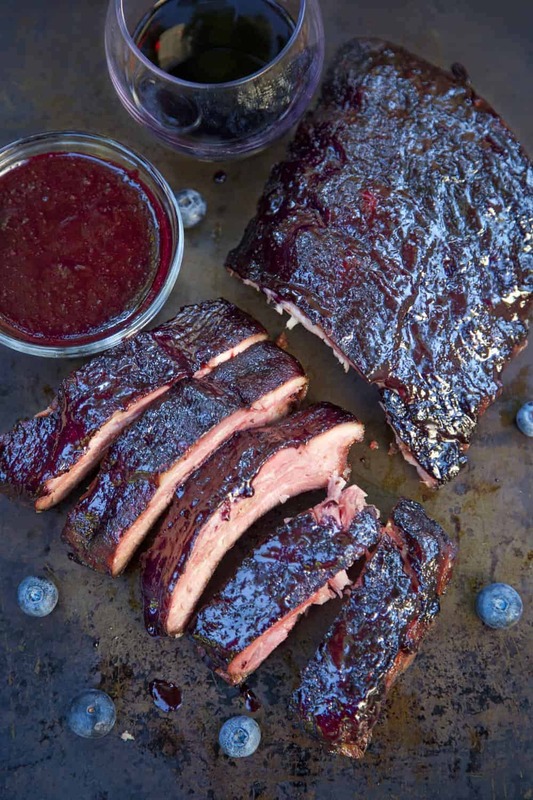 The recipe for Blueberry Bourbon BBQ sauce also goes great on chicken or pork! 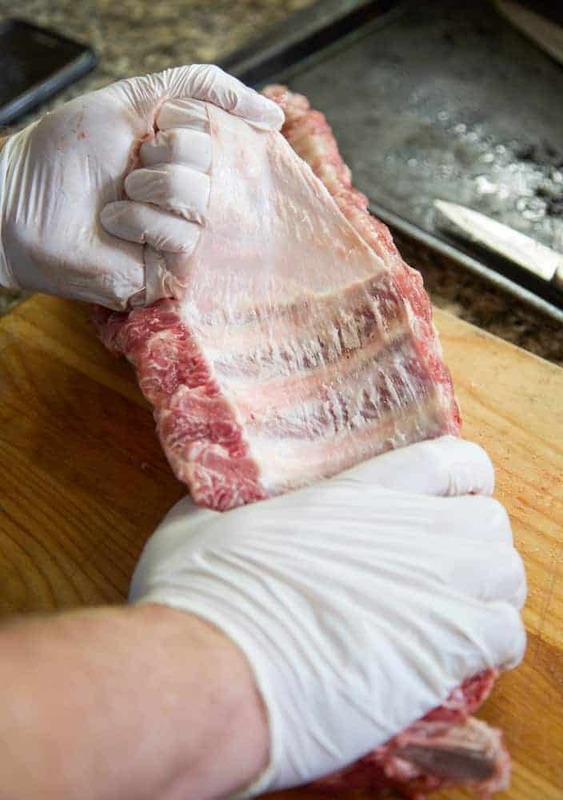 Prepare ribs by removing membrane off of the bone side of the ribs using a paper towel, then rinse under cold water and pat dry. Coat the ribs with the Dijon mustard and then liberally apply your favorite dry rub. Let sit at least 20 minutes or let rest for several hours seasoned. When the bones start to protrude from the ribs, you are going to wrap in foil. Layout your foil and place 2 tablespoons butter and a drizzle of honey (or agave) along foil. Then place your ribs meat side down, on top of the butter and honey and wrap tightly. Place back on smoker for roughly 2 hours. Check at about 90 minutes to see if you need to unwrap, you are ready to remove the foil when the bones are loose as you pull on them, but not coming out of the meat. 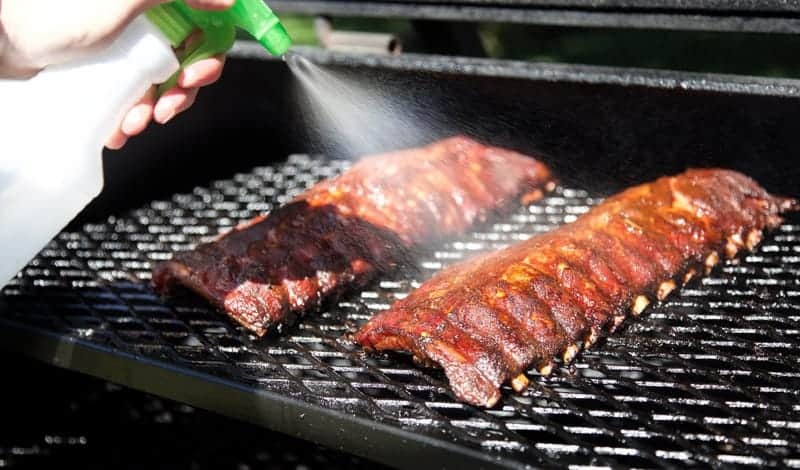 After removing the foil, place ribs meat side up onto the smoker and apply your glaze. Let sit another 20 – 30 minutes or until the glaze has tacked up. Remove from smoker and let rest for 10 minutes loosely tented in foil. Then cut up and serve. Add blueberries, bourbon, rosemary, sugar, and salt to a small pot and bring to a simmer. Crush berries as it first comes to a simmer. Lower heat to keep a small simmer and stir frequently for another 8 minutes. Remove from heat and let cool. I had a feeling this might be a tricky pairing. The smoky ribs, with the savory rub mixed with the rich bold flavors of the sweet and savory BBQ sauce. I didn’t want to just go with something refreshing to contrast the richness. Instead I really wanted to find a wine that could stand up to the boldness and complexities of this sauce. But not too bold. Remember, this sauce isn’t super sweet, nor is it spicy, or too acidic. It’s complex and deep. I’d been curious about this Petit Sirah I was sent. Again, this could have been tricky, as it could have been an inky intense wine. You never know. But hot damn, if ever I was happy to go with my hunch! This looks amazing! I may be tempted to eat that sauce with a spoon! Oh my goodness those ribs look good! I’m with you on the blueberries, they’re one of my favorite berries too, so I love that you incorporated them into this recipe! I think I would have chosen a Petit Sirah as a pairing too, or maybe given a Zinfandel a try…? I always learn so much from you guys! I’ll have to remember to try spritzing the meat every 15 minutes the next time we grill. The blueberry bourbon flavor combo sounds so intriguing. I love both flavors and bet it’s a fantastic combo! It’s a really awesome combination!! 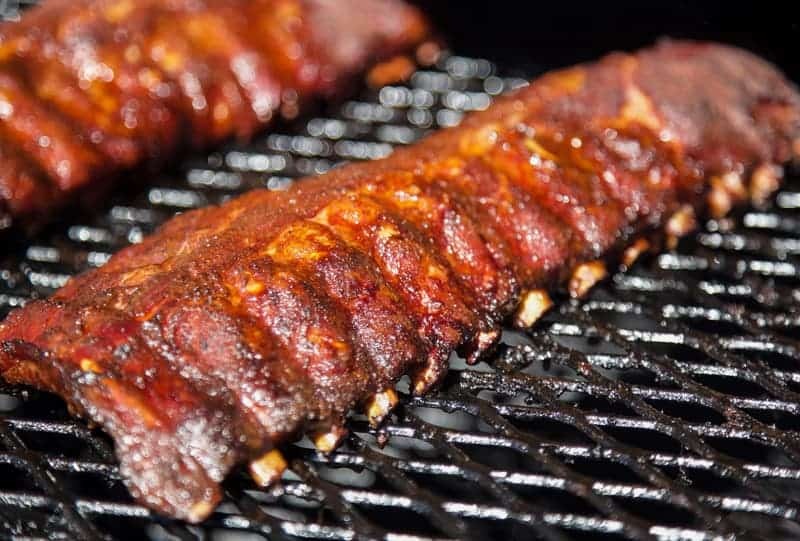 Oh my goodness, these ribs look amazing! Our blueberries are ripe and my husband is itching to barbecue some ribs. The universe is telling me that we should try this out!